You have some reliable and outstanding performers on your team…but dealing with their idiosyncrasies on a daily basis makes you question whether or not they’re worth putting up with. OfficeMax Cofounder and former CEO Michael Feuer gives some welcome advice on how to manage your difficult employees without sacrificing their productivity. If you’ve ever watched NBC’s The Office, you know that the show makes hilarious use of business-world stereotypes. Granted, the personalities, quirks, and antics of the employees of the fictional Dunder Mifflin Paper Company are taken to extremes, but we find them funny largely because they’re true. We know that guy—the one who cracks terrible joke after terrible joke, unaware that all he’s getting are eye rolls. We’ve also encountered the sanctimonious perfectionist, the attention-seeking prima donna, the unhelpful duty-shirker, and many others. Sure, it’s funny on TV…but in the real world, dealing with these characters can make leaders want to pull out their hair or throw in the towel entirely. Before you resign yourself to living in your own not-so-amusing TV show, OfficeMax Cofounder and former CEO Michael Feuer provides some commonsense management advice. 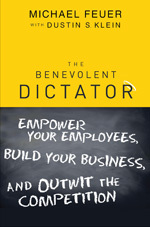 “First, know that there is no need for you to waste your time with poor performers or high maintenance employees who have an inflated sense of their own importance and ability,” says Feuer (pronounced “Foyer”), author of the new book The Benevolent Dictator: Empower Your Employees, Build Your Business, and Outwit the Competition (Wiley, 2011, ISBN: 978-1-118-00391-6, $24.95, www.benevolentdictator.biz). Feuer knows what he’s talking about: He has launched a number of successful business ventures, including OfficeMax and his newest business, Max-Wellness, a new and unique health and wellness retail chain. The lessons he’s learned, as he writes in The Benevolent Dictator, have convinced him that leaders are most likely to succeed when their management style mirrors that of a benevolent dictator: At the end of the day, the “dictator” side of you calls the shots and makes the difficult decisions, but your “benevolent” side does so while putting the interests of the organization, your team, and your customers ahead of your own. And though it’s not easy, this means reining in your hard-to-handle employees while still developing their talents. The Live with ’Em Solution: The easiest solution here is to put your cards on the table. Tell your prima donna how valuable he is and how grateful you are for his work, but also let him know that he’s a real pain to deal with, and that he’s approaching a crossroads. Ask what you can do to avoid future problems and stress that your door is always open—but make it clear that these behaviors need to change (or else). “Make him a part of the solution by putting the onus on him to come up with a fix for a peaceful and productive coexistence,” advises Feuer. “Allow him to win, but on your terms, not his. Remember that most prima donnas are typically okay people deep down inside. Usually, their egos have been stroked too much in the past, or they’re hiding a major inferiority complex—or both. The Live with ’Em Solution: “Not everything an employee is asked to do is going to fit comfortably into their pre-determined job description,” notes Feuer. “But the fact is, a successful organization is a team effort, and sometimes people need to do more to help out. “I have come close to firing employees on the spot for refusing to help on the grounds that the task at hand wasn’t their responsibility,” he shares. “Now, I make sure that every member of my team knows that ‘whatever it takes’ isn’t an option—it’s a requirement. Ultimately, it doesn’t matter if someone is an administrative assistant or a vice president—it’s all for one and one for all. 3. The Perfectionist M.O. : Nobody can deny that your resident perfectionist is a hard worker. He makes sure every “i” is dotted and every “t” is crossed—every time. He’ll continue to tweak a report or project hours after someone else would have declared it complete. The Live with ’Em Solution: Normally, an employee who thinks that a half-baked effort is unacceptable would be an asset. The problem is, when it comes to not accepting anything less than perfection, there can be too much of a good thing. As a leader, you must make sure that your employees don’t sacrifice too much time—or end up failing to achieve anything at all—in a quest for the best. “Don’t get me wrong—I’m not saying that you should encourage lackluster performances or tell your team that they shouldn’t worry about getting it right the first time,” Feuer clarifies. “After all, it can cost your organization quite a bit if time and energy aren’t used wisely. Remember that if you’re putting out a fire in a garbage can, you need only a few gallons of water—not an entire water tanker! Michael Feuer cofounded OfficeMax in 1988 starting with one store and $20,000 of his own money, a partner, and a small group of investors. As CEO, he grew it to more than 1,000 stores worldwide with annual sales topping $5 billion. He is also CEO of Max-Ventures, a venture capital and retail consulting firm, and founder and CEO of Max-Wellness, a comprehensive health and wellness retail chain that launched in 2010. After opening initial laboratory test stores in Florida and Ohio, a national roll-out is now underway. Dustin S. Klein, contributor and editor of The Benevolent Dictator, is the publisher and executive editor of Smart Business Network, publishers of Smart Business, the nation’s second-largest chain of regional business publications. He has interviewed thousands of senior executives and civic leaders across America. He is a regular presenter on business-related issues for public and private business audiences and is a frequent guest on television, radio, and Internet programs.